The last thing we needed was a roadblock. I feel exposed -- I am a white woman in the passenger seat of a car in Nicaragua. The people of Barrio Nuevo Amanecer, in Esteli, Nicaragua, are protesting against violence in their community. Their grief is fresh because last week, a 23-year-old mother of three was murdered. Forced into prostitution by her husband, her life was taken by a john. The last thing we needed was a roadblock. I feel exposed -- I am a white woman in the passenger seat of a car in Nicaragua. My heart skips a beat. As we drive closer, it becomes apparent that there is a protest, and the crowd is growing. We will have to go around. Rudy Rojas, director of Christian Horizons programs in Guatemala and Nicaragua, drives our car carefully across a culvert, and onto a secondary road scattered with rocks. Jose, our Nicaraguan coordinator, climbs out of the car to find out where we can park. The protesters surround us and our car as we begin to exit. Around me there are truck beds packed with children and youth; adults on foot carry babies and flowers. There is a mournful melody spilling into the street from somewhere. This protest seems like a funeral, and we soon learn why. The people of Barrio Nuevo Amanecer, in Esteli, Nicaragua, are protesting against violence in their community. Their grief is fresh because last week, a 23-year-old mother of three was murdered. Forced into prostitution by her husband, her life was taken by a john. We visit with families in their homes. While in one such home, the clouds open up and release a heavy rain. The water finds its way through cracks in the pieced-together roof. The owner, Raina Castio, speaks to me in Spanish as Rudy translates. "We need more plastic [tarps] to cover the roof. It is a real problem, having water come into the house," she explains. "Sometimes when it rains a lot, it covers the floors, too. This is a problem for the whole community." We ask questions about the protest we witnessed, and another young mother advises that she does not feel safe to leave her house alone. "If you leave your house with no one in it, other people will come and take everything that belongs to you." There is so much crime that in order to leave, they must ask a trusted neighbour to watch the house while they are out. I think that sounds pretty extreme, but when I look around the shack we're visiting, I realize that there isn't a door. What other option do they have? Prostitution is an unfortunate reality in this community, with girls as young as 12 soliciting johns. It breaks my heart to think that the little girls tugging my skirt, dressed in their finest clothes, faces sparkling with glitter and hair smoothed into braids in preparation for our visit, might be at risk of this same fate. "What are some of the good things in your community?" asks Mark Wallace, Canadian director of CH Global. Rudy translates Flora Myraina's response. "I may not have a good house, but I have land, which means that I can I have a chance for a better future. Second, I have a very good neighbour, and we can protect each other. And the church, where we all attend. Pastor Victor is very good, and he visits our home to make sure we are OK."
Incredibly, Flora's nine-year-old son Louis wants to be a lawyer when he grows up. Flora's neighbour is Johanna, a married mother of three. Johanna has enthusiastically volunteered to coordinate the CH Global child sponsorship program in the community. So far, 70 children have a dedicated sponsor. Through partnerships with the local church we will try to meet the needs of 90, providing food, shoes and other resources for families. Our visit to Esteli is the first for our Canadian staff, as it is our newest program venture in Nicaragua, only recently coming to fruition. Over and over, the families we visit thank us for coming, and for the work that we are doing. Even knowing that the sponsorship program is just beginning here, it is good to see the hope shining in the eyes of the mothers we speak to. They are invested in their children; in every home we visit, school photos decorate the scant walls, and first-grade diplomas are proudly displayed. Even in a desperate situation, with heartbreaking stories of loss, these families find reason to hope.They band together to protect each other, encourage and support each other, and fiercely defend their community from the violence that rocks it. Later, driving down the cobblestone road, I feel humbled by the poverty of the families who welcomed me into their homes. 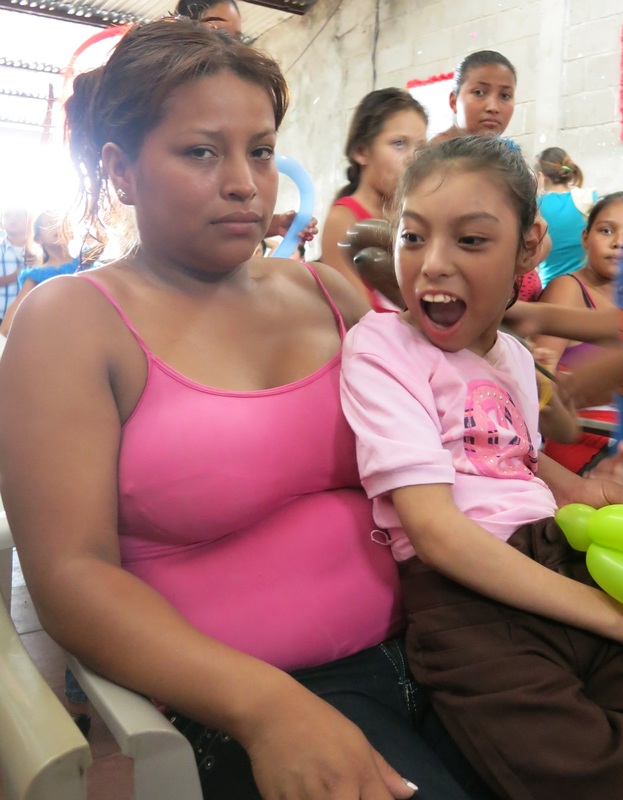 I'm left with an ache in my stomach for the stone-faced mother carrying her severely disabled 10-year-old daughter around as her other children played nearby. I am in awe of the strength it must take for her to survive each day. The stories of pain and resilience that I saw and heard to remind me of the unequal hands of wealth and opportunity that people are dealt in life, and I am challenged to rethink my perspective. Seeing the impact of child sponsorship programs proves that, while donors are far away, it is the local community leaders that decide the greatest need, that name the solution, and ultimately are empowered to relieve at least a portion of the burden felt by families in their communities. As a donor to several charities, I know that it is easy to distance myself from my giving. Sometimes, my thoughts can turn critical, wondering if my money really does have an impact in the community. Today, I felt the opposite, that the needs are so great that my money could hardly make an impact. But at just the right time, I was reminded of something Mother Teresa said: "We ourselves feel that what we are doing is just a drop in the ocean. But the ocean would be less because of that missing drop."